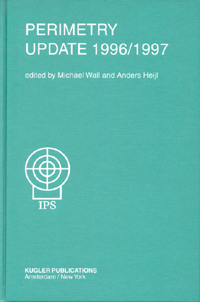 Publication details: Book. 1997. xi and 477 pages. Publication date: 1997-09-30. 167 illustrations of which 5 in full color, and 63 tables. Hardbound. The Twelfth Annual Symposium of the International Perimetric Society was held in Würzburg, Germany, June 4-8, 1996. There again were interesting and informative scientific sessions. As usual, an exceptionally well-coordinated social program was enjoyed by all. In the scientific sessions, papers and discussions of posters were interleaved within ten sessions: Epidemiology, Neural Networks, Visual Field Progression; Cataract and Diffuse Loss; Clinical Observations I and 11; Blood Flow and Nerve Fiber Layer Analysis; New Methods of Perimetry; Image Analysis and Glaucoma; Perimetric Techniques Reliability; Artifacts and Instruments; and Psychophysics and Electrophysiology. The many excellent presentations attest to the continued fine perimetry research on five continents. Again, at this meeting, two sessions were devoted to ophthalmic imaging; this field continues to advance. One hundred and seven presentations were given, 55 were platform presentations and 52 were given as posters. Nineteen countries were represented. We wish to thank those members of our executive committee, who helped with peer-review of the submitted manuscripts: President John Wild, Vice President Yoshiaki Kitazawa, Treasurer Fritz Dannheim, Past Secretary Richard Mills, Group Chairman Evanne Casson, Bernard Schwartz, Jörg Weber, William Hart, Avinoam Safran, Balwantray Chauhan and Enrico Gandolfo, and Members-at-Large Mario, Zulauf and Elliot Werner. The XII Annual IPS Symposium was hosted by Eugen Gramer of Würzburg with much help from Fritz Dannheim. A special thanks goes to Diane Anderson of the University of Iowa Department of Ophthalmology for proofing and editing the manuscripts. We also thank Joey Haug, of the office of the secretariat, for her efforts in the organization of this monograph. We are all looking forward to our next meeting, The XIII International Visual Field Symposium in Lago di Garda, Italy, September 6-9, 1998. Is early damage in glaucoma selective for a particular cell type or pathway? Is calibrated trabeculectomy harmful to visual function?